August 28, 2018 January 14, 2019 ~ Mike K.
So, I will completely admit that once we (my girlfriend and I) decided to go Croatia for vacation, I geeked out a bit because we’d be able to see where the King’s Landing scenes from Game of Thrones were filmed. I will also admit that as we were deciding on what to do in each of the cities we were to visit, I MAY have scouted out what escape rooms were in the area. To that point, when I saw that there was a Game of Thrones escape room in Dubrovnik, I knew that we had to do it… or we’d end up regretting it the whole trip. After reading the description and seeing that it harkened back to the Battle of Blackwater Bay, I was all in. This room has also licensed some of the intellectual property (IP) of the show to allow them to use some of the materials, which was a great marketing decision on Dubrovnik Escape Room’s part. The enemy forces (Stannis) are sailing into Blackwater Bay and you have to find out a way to defend King’s Landing from the invasion. The King’s Hand (Tyrion) has ordered you to go to the meister’s alchemy lab to secure the wildfire potion, which – after being set afire – will burn through anything. Unfortunately, however, when you arrive at the meister’s lab you find that he’s away um… purveying the wares of the local brothel. So, you find yourself alone in the meister’s lab, with Tyrion depending on you! The mission seems easy when it’s first presented to you, but there’s a bit more to it that is revealed to you during the experience, so I can’t tell you that much more without giving it away, but it’s totally worth some secrecy. 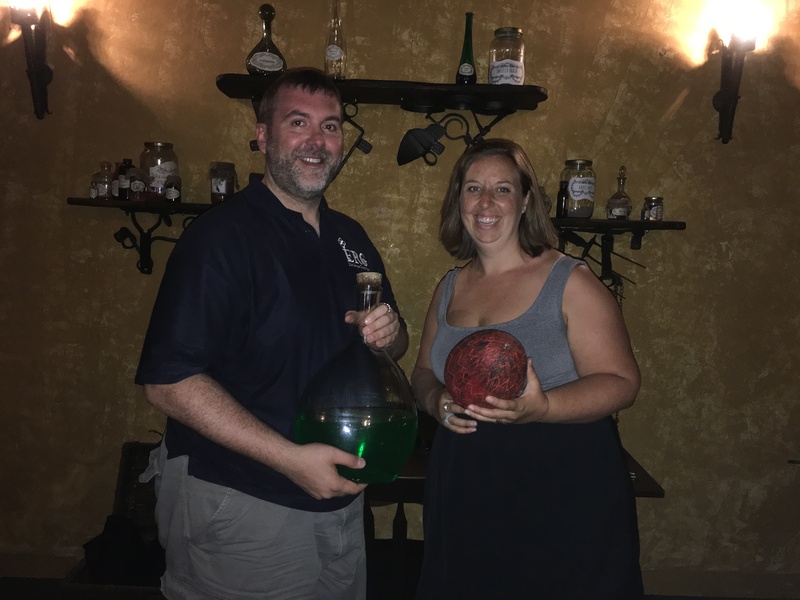 Let’s just say that what we had to do had me questioning some of the basic “rules” I’ve followed since I started doing escape rooms almost three years ago. So, first of all, there were a good number of puzzles and locks in this room, and I actually got to see a different type of lock that I’d never seen before. It is a sliding combination lock where the lock latch completely slides out of the the casing versus the latch going into a slot on the top or side. We were warned that the lock type is a bit fickle (you have to have all the tumblers perfectly lined up). Now, onto the room itself. There were some key locks and some different type of combination locks, but there were also locks that were triggered by RFID chips and magnets, so overall a great mix of the types of locks that secured away the next parts of the puzzles. The puzzles… damn, there was a great mix, ranging from a few that depended on simple observation, while others required you to decode cyphers, or solve riddles or evaluate the solution you came up with against another set of criteria to find the final answer. My absolute favorite in the room was part of what you figure out about the mission when you’re in the room, but it’s all related to finding the wildfire and how that potion was created so that’s all I can tell you. It is so freaking cool, though, and the first puzzle of that kind I’ve ever experienced. I even had to ask our GM (Bogdan) if what I thought I had to do was really what I was expected to do to solve the puzzle (I didn’t want to accidentally destroy anything). When I found out that was how I was to proceed, I could actually feel my heart pounding in my chest because it felt so forbidden and it was that awesome. The puzzles in the room took some time to figure out, but I don’t believe that any were so overly complex that a team of two wouldn’t have been able to solve them. The first puzzle was something we had to search for and then work with another item found to start our path to solving and finding and solving and finding. There were two puzzles that we asked for a hint on… simply because we had a lot of options available and we decided to ask for a hint on the first puzzle (I think it was the 3rd puzzle in the room) so we didn’t get too far behind. Later on, we asked for clarification on how one of the props worked, and finally at the end on wether Heather’s approach or my approach was the correct one. We generally go into the rooms with an expectation of using no more than 3 clues, so we ended up using all 3 just so we could get out and see every puzzle through to its conclusion. There was a good range of the complexity of the puzzles… we searched and then put everything in one place, and then we started matching those items against other things in the room. Some were a bit more obvious than others and some were very, very subtle in how they were associated. So, this was a hell of a lot of fun even with just the two of us. Some of the puzzles were easy enough to solve quickly; others needed a bunch of time for us both working on it to get it figured out, while others were complex, but solved quickly because of how we associated certain things together from doing a good search of the room from the beginning. So, this was pretty much a linear room, but the room is only rated for up to 5 people so I’m totally willing to forgive that. The design of the room is really well done in how you start and then how everything plays on something else until you get to the end. We did search for about 12 minutes until we found everything we needed to solve our first puzzle, but then the rest flowed pretty well from there. Since it was just the two of us, we asked our GM before going into the room if he would tell us what percent of the way we were through, so we could decide on whether we’d ask for a clue. He said that was hard to do because of the room’s design and once you hit a certain point, the rest of the room would progress very quickly. This was very accurate. I think we solved 5 or 6 puzzles in the last 10 minutes. The flow of the room was very well done… you had to work to get to the first puzzle, but then everything seemed to just fall into place once you solved each puzzle. The decorations were phenomenal. I did feel as if I was in the meister’s lab from the show (I was waiting for the old man in a white robe to pop out somewhere). All of the props you found were very related to the show itself (although not all specifically to that particular episode where they had to defend Blackwater Bay)… there is one prop that actually doesn’t fit this area of Westeros at all, but what you had to do with it was a lot of fun and still fit the GOT world. Finally, we got to see some new stuff here… specifically that one puzzle I referenced. Yeah, I was vibrating with excitement right before we went into this room. I was not disappointed. In fact, I told the owner (and our GM), Bogdan, that I was both excited and fearful that someone would do a GOT-themed room… excited because I wanted to do a room with that theme… and fearful that someone would do a GOT-themed room and not do the subject matter justice. Upon exiting the room, I told him that I was so happy that excitement won the day, and that his room was exactly what I was hoping for in the experience. Bogdan was great. He gave us the nudges when we asked for it, or when he saw that we were having trouble operation one of the props. We asked for three hints, all of which were helpful… one was to actually clarify which of us were trying to solve the puzzle correctly (Heather was correct). Just a small bit of frustration, but nothing that took away from the experience. Final Thought: If you go to Dubrovnik, do yourself a favor and book this room. It’s a great way to experience one of your favorite TV shows in the city where part of it is filmed. The room is well done and I’d love to hear how it gets switched up. Sadly, repeated trips to Croatia are not in my budget, so I’ll have to depend on you – faithful readers – to comment here or on our social media to keep me in the loop.